with alpaca blend yarn for extra warmth. White Light is worked from top down in one piece. 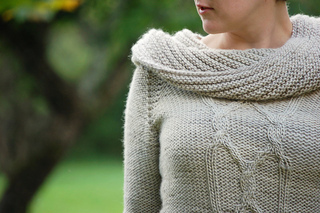 It has a big cowl neck and the cables at front. Finished bust circumference: 30 (34, 38, 42, 46, 50)” 75 /85, 95, 105, 115, 125) cm.